Shows a message to people awaiting activation by email or admin. IMPORTANT: PLEASE DO NOT USE THE REVIEWS SECTION FOR SUPPORT OR TO REPORT BUGS. THERE IS NO GUARANTEE I WILL SEE IT, AND I CANNOT REPLY THERE, SO I CANNOT DO ANYTHING TO ACTUALLY HELP YOU. TO GET SUPPORT, MAKE A SUGGESTION OR REPORT A BUG, USE THE FOLLOWING LINK. Description: Shows a message to people awaiting activation by email or admin. 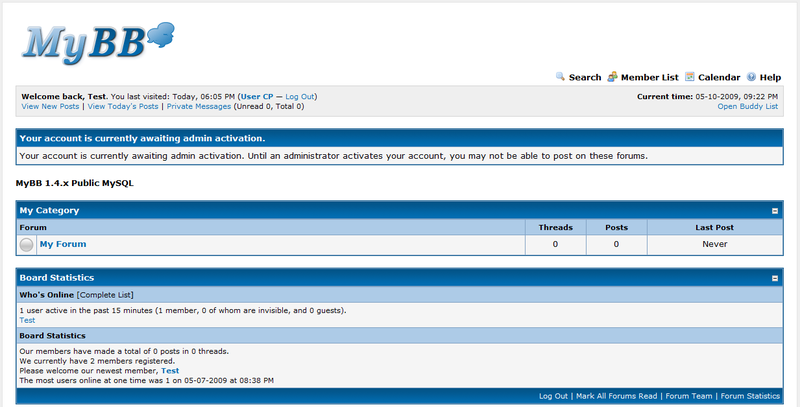 This plugin will add a message to the header of your forums if a member is awaiting activation, and you have account activation set to either email or admin activation. The message will display in your theme's style. 28/01/09 - v1.0 -> v1.1 -> Deactivate v1.0, upload v1.1, activate. 2 settings removed. 08/05/09 - v1.1 -> v1.1.1 -> Minor changes to files, upload new version, overwrite old, no need to deactivate. 10/05/09 - v1.1.1 -> v1.2 -> Message is now at the the top of all pages, no longer collapsible. Deactivate, reupload ./inc/plugins/aamessage.php, activate. 01/09/10 - v1.2 -> v1.6 -> Uses language file. 1.6 compatible only. 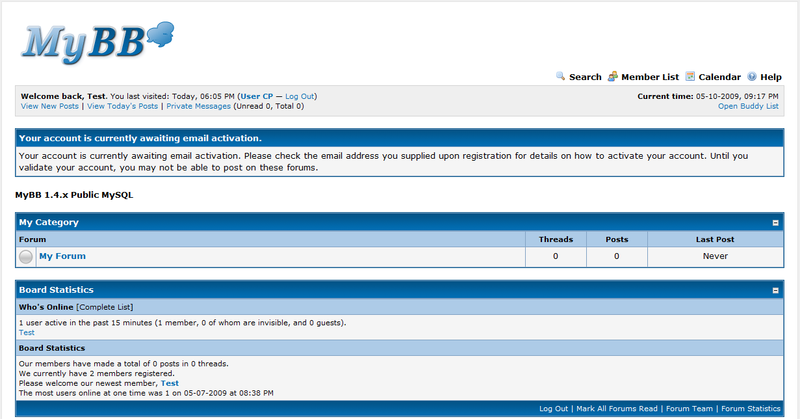 24/08/14 - v1.6 -> v.1.8 -> MyBB 1.8 compatible. Supports new account activation method of 'email and admin'. To upgrade, deactivate, reupload ./inc/plugins/aamessage.php and ./inc/languages/english/aamessage.lang.php, activate.